Yesterday was a sad day since Amit passed away. 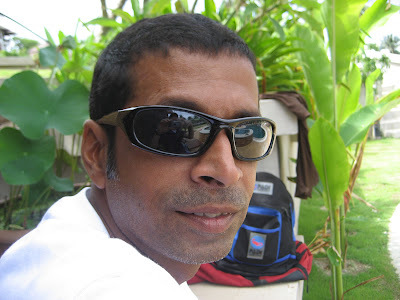 Amit arrived on Koh Samui late 2002 /early 2003 to start his Open Water diver course, all the way up to Instructor! Straight out of Bombay he showed up with no previous diving experience. That was a tremendous step. He worked as a Divemaster and in June 2003 he participated in the second IDC I ever taught as a Course Director. All through to September 2007 when he participated in his IDCS course, he worked on Koh Samui, most of the time for and with Tom and Cecilia at Planet Scuba Samui, the outlet at Central (now called Centara) Beach Resort. Amit during the September 2007 IE on Koh Tao. He had to endure hard visa rules but in his own way he found ways around this and managed to smooth out his problems for once and for all, but eventually he wanted to move on and found a job in his native India, at the Nicobar islands. Last year we celebrated his 40th birthday at the Bamboo bar in Bang Rak, his favorite hang out place just around the corner from where he lived and the place was packed. Everybody involved with diving on Koh Samui was there. He left Samui not even 3 months ago and now he's gone, after a very short stay at a Bombay hospital, where he was evacuated to, only 5 or 6 days ago. Amit, I will always remember you for your perpetual smile and your patience. You were also one of the more experienced PADI instructors on Koh Samui and it was always good to see you early mornings at the pier, enjoying your coffee, even if you weren't on the boat. He was one of the nice guys on this world, always in a good mood. The world will be a lesser place without you! There's a Facebook group, Friends of Amit, feel free to join. Amit after passing his IE, June 2003.